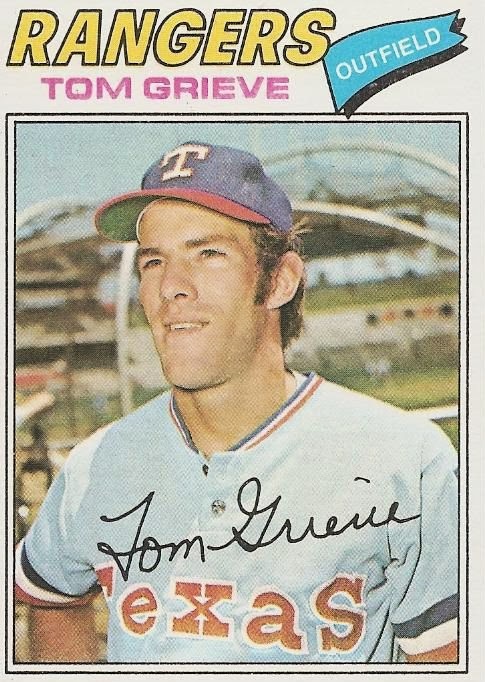 Texas Rangers Cards: 1977 Topps - Tom Grieve. 1977 Topps - Tom Grieve. Following a mixed season in 1976, Tom Grieve returned to a backup/designated hitter role in 1977. Grieve, shown here on card 403 of the 1977 Topps set, played in 79 games for Texas that year. He made 255 plate appearances while compiling a .225 batting average and a .273 on-base percentage. those numbers were all significant drops from the previous season. Tom's power also deserted him as his home run total dropped from 20 to just seven. All the while he was being victimized by his old nemesis, the K. Grieve would strike out 57 times in 1977 while walking just 13. In his backup role Tom played 443.1 innings combined at the two corner outfield positions. He did not appear in center and spent most of his time in right field. He made just two errors but still ended up with a .976 fielding percentage, two point under the league average. It was looking more and more like Tom Grieve had been given his chance with Texas and failed to nail down a starting spot. He was looking at a backup role for the foreseeable future with the team. That future might or might not extend very far, backup players are usually available for trade. Senators Saturday - Howie Koplitz, 1964. Best Seasons: Buddy Bell - 1979. Best Seasons: Mark Teixeira - 2005. 1977 Topps - Steve Foucault. 1977 Topps - Bill Fahey.